Alphasat is a prototype satellite as it is the first to fly the new Alphabus satellite platform for heavy Geostationary Satellites. The Alphabus platform was developed by a joint venture between Thales Alenia Space, EADS Astrium, the French Space Agency and the European Space Agency. Inmarsat – a British satellite telecommunications company, offering global, mobile services – awarded a contract to Astrium for a first use of such a platform. 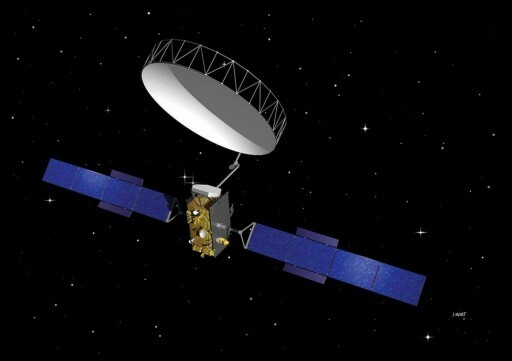 Funding for the prototype satellite was provided by ESA and Inmarsat. Due to market demand, Thales and Astrium set out to combine lessons learned from their well established GEO satellite buses, namely Spacebus and Eurostar, to develop a new heavy GEO satellite platform. Alphabus is capable of hosting a number of different communication payloads with payload power in a range of 12 to 22kW and a variety of options such as electric propulsion and scalable resources. The platform can accommodate up to 190 transponders and large antenna farms. The satellite bus is based on a central tube acting as vertebral column and 2.8 by 2.49-meter carbon and aluminum panels making up the satellite bus structure. The platform features solar array wings with 4 to 6 panels featuring Gallium-Arsenide Solar Cells that feed Lithium-Ion batteries. Alphabus can support 50 and 100V regulated buses. Attitude determination and control is accomplished with gyros, star and sun sensors as well as reaction wheels. The satellite platform supports both, chemical and electrical propulsion systems. A main propulsion system is used for apogee maneuvers and 16 ten-Newton Thrusters are used for Stationkeeping as well as attitude maneuver. Alphabus can hold a maximum fuel load of 4,200kg of bipropellant, Nitrogen Tetroxide and Hydrazine. Tank pressurization is accomplished with high-pressure Helium. To extend its lifetime by decreasing fuel consumption, Alphabus can facilitate Xenon Ion Thrusters for electrical propulsion. Data handling is accomplished with a 1553-data bus. With ESA and Inmarsat sharing the cost of the first flight model, the satellite payload will also be shared. 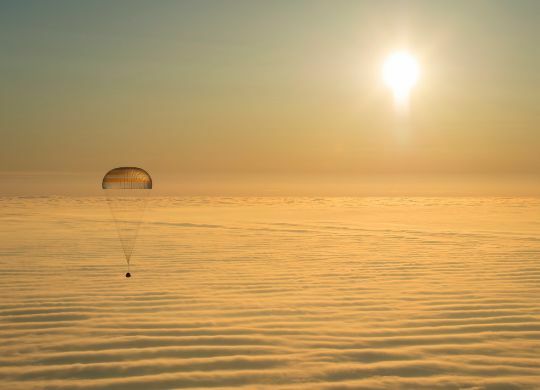 ESA was allocated 15% of the total payload of about 2,000kg for four technological demonstration payloads. The rest will be comprised of Inmarsat’s L-Band communications payload. Alphasat is 7.1 by 2.5 by 2.8 meters in size when stowed and it will have a span of 40 meters once its solar arrays are deployed in orbit. The satellite has a launch mass of 6,650 Kilograms. The vehicle features two four-panel solar arrays and a large antenna reflector that are deployed in orbit. 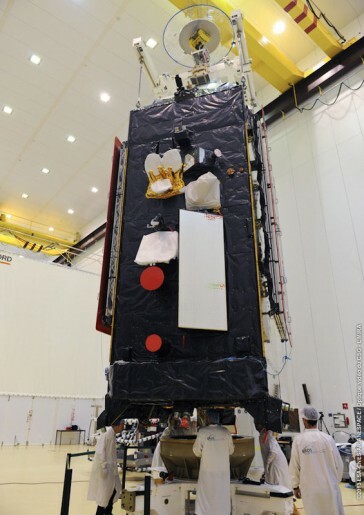 The Inmarsat payload consists of an L-Band communications payload that will extend the company’s Geo–mobile infrastructure in terms of performance and capacity dedicated to the Broadband Global Area Network (BGAN) that provides a wide range of high data rate applications. Alphasat will support both, BGAN directional services as well as BGAN omni-directional services for portable and hand held devices. Multi-spot beam technology will allow Alphasat to supplement the existing Inmarsat constellation and provide new and advanced services. The vehicle is equipped with an S400 Propulsion System for apogee burns and larger orbit maintenance maneuvers. The S400 series built by EADS Astrium are bi-propellant engines using Monomethylhydrazine and Mixed Oxides of Nitrogen as propellants. Depending on the version used, S400 provides 420 to 425 Newtons of Thrust with a specific impulse of 318-321 seconds. In addition, Alphasat makes use of the electric propulsion capability provided by the Alphabus. SPT-100 Stationary Plasma Thrusters will provide 83 Millinewtons of thrust each for stationkeeping and attitude maneuvers to prolong the satellite’s chemical fuel supply. 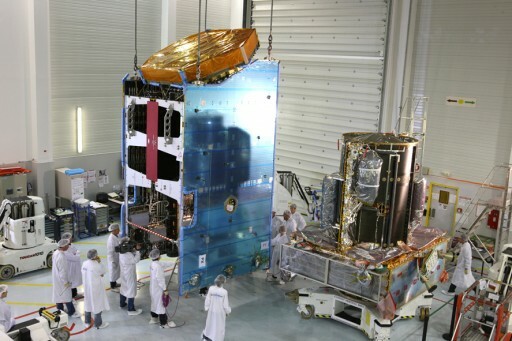 The four ESA demonstrator payloads include a Laser Communications Terminal to demonstrate high data-rate communications between Low Earth Orbit platforms and Satellites in GEO reaching a bandwidth of 2Gbit/s. A Q-V Band payload will be used to assess the feasibility of these communication bands for future commercial applications. V-Band ranges from 50 to 75 GHz while Q-Band has a frequency range of 30 to 50 GHz. The third demonstration payload is an advanced star tracker with active pixel detector that will be put through its paces to assess the design for future use. An lastly, Alphasat is equipped with an environment effects facility to monitor the radiation environment in Geostationary Orbit to learn more about its effects on electronic components and sensors. Alphasat has a expected on-orbit lifetime of 15 years. The satellite will operate from 25 degrees east covering Africa, Europe, the Middle-East and parts of Asia.